Jay Ireland, President & CEO of GE Africa was named as chair of the second President’s Advisory Council on Doing Business in Africa (PAC-DBIA) by U.S. Secretary of Commerce Penny Pritzker. 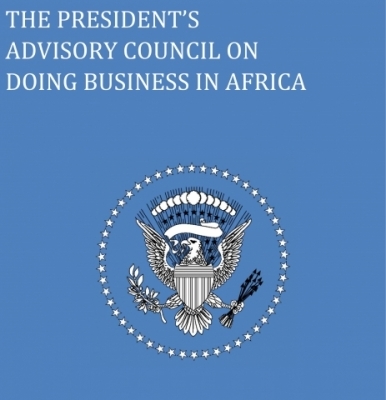 PAC-DBIA members – representing small, medium, and large companies from a variety of industry sectors – advise the President, through the Secretary of Commerce, on ways to strengthen commercial engagement between the United States and Africa. The appointments are announced in conjunction with the second U.S.-Africa Business Forum. This historic event connects hundreds of American and African chief executive officers and business leaders, along with African heads of state, to discuss overall economic growth and to stimulate additional trade and investment between the United States and Africa. Kusum Kavia, President, Combustion Associates, Inc.
Barbara Keating, President, Computer Frontiers, Inc.
As part of his commitment to deepen engagement between the United States and Africa, President Obama signed an Executive Order (E.O.) at the 2014 U.S.-Africa Business Forum to establish PAC-DBIA. The PAC-DBIA has provided information, analysis, and recommendations on U.S.-Africa trade and investment priorities. Such priorities include job creation in both the United States and Africa, developing sustainable commercial partnerships, building entrepreneur capacity, and keeping the private sector engaged in developing policies and strategies on investment in Africa. Highlights of the previous PAC-DBIA’s recommendations include launching the institutional investor roadshow with several African countries and convening an East Africa cold chain symposium. U.S. merchandise exports to sub-Saharan Africa increased 19 percent from 2009 to 2015, reaching more than $18 billion last year. Total U.S. exports of goods and services to the continent of Africa reached $42 billion in 2015, representing total growth of 17 percent in the same period. In addition, between 2009 and 2015, U.S. goods exports to five sub-Saharan African countries – Ethiopia, Togo, Mauritania, Burkina Faso, and South Sudan – and U.S. goods exports to an additional five countries have increased more than 50 percent – Mali, Swaziland, Sierra Leone, Democratic Republic of the Congo, and Benin.